4Grinz is an online casino, initially launched by CoinGaming.io- a reputable brand which is a silver member of the Bitcoin Foundation, which has more recently come under the ownership of SoftSwiss. This gambling brand’s high status in the Bitcoin space comes as no surprise considering the fact that 4Grinz is dedicated solely to Bitcoin bettors. As previously mentioned, 4Grinz is powered by SoftSwiss, which is always a good sign that a site boasts high quality software and games. Unfortunately there is very little information available about the licensing of this 2015-established casino site; it is unclear which governing body the casino holds a license in and how well regulated it is. However, it is clearly displayed on the homepage that the games are provably fair and independently audited by iTech Labs. The site’s popular reputation online (which we’ll discuss in more detail in just a moment) suggests that the lack of clear licensing has not been an issue for many 4Grinz customers, but this is a question for each individual player. There are hundreds of Bitcoin games available to play at 4Grinz, divided into the following categories; slots, video poker, roulette, poker, casual, card games and jackpot games. All of these games have been provided to the casino by high quality content developers including Ezugi, Endorphina, Amatic Industries, BetSoft and, of course, SoftSwiss. Unsurprisingly, the most fully stocked section of 4Grinz is the slots category. There is a huge amount of high quality Bitcoin slots to enjoy here, from iconic casino favorites to lesser-known, but equally enjoyable titles. Then there are all the usual classics waiting to be played in the table and card game sections. Whichever style of game bettors opt for, there is no shortage of fun, exciting ways to win instant Bitcoins at 4Grinz. The fact that 4Grinz is a Bitcoin-only platform narrows down its audience quite significantly. Reviews online from members of the public suggest that the vast majority of customers are very happy with the casino’s customer service, payouts and overall quality. The site prominently displays its commendations by trusted sites like Gambling with Bitcoin and The Bitcoin Gambling Guide, linking to positive reviews on its homepage. Another positive aspect of 4Grinz that many reviewers and customers have picked up on is the wealth of information it has to offer about Bitcoin betting, buying Bitcoins and getting started with this crypto-currency. There is a very interesting and inviting range of promotions at 4Grinz, all of which revolve entirely around the premise of Bitcoin. The most notable of these offers is Coin Back which, as the name suggests, refunds qualifying players with at least 10% BTC back on their net losses over the course of a whole week. Then there is Deposit Back. This deal has the same premise as Coin Back, but gives 10% back on losses made in one day. Both of these ongoing promotions are sure to appeal to plenty of Bitcoin bettors, especially since they do not come with any minimum wagers or rollover requirements. Like most decent casinos these days, 4Grinz also has its own VIP program. 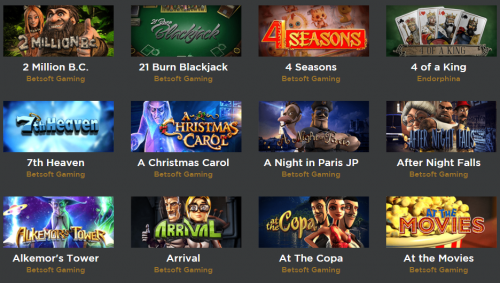 As soon as any player has deposited and staked at least 1BTC at the casino, they will begin earning Grinz Points and working their way through the various loyalty levels from Premium Member to VIP Gold and Black. The most positive aspect of 4Grinz is its payment processing procedures. The casino is definitely up to speed with the most modern forms of online virtual and mobile gaming. Players will benefit from the Bitcoin-specific bonus offers and the speedy, anonymous banking this crypto-currency provides. However, even though the games at the site are listed as being provably fair, it is impossible to fully endorse any betting venue that does not overtly disclose its licensing information. 4Grinz does not currently offer any Bitcoin bonuses to its players!